2. 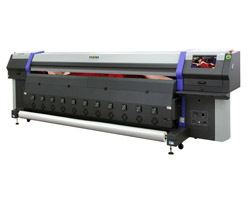 It is mounted with 8 print heads to accomplish printing in 4-color (CMYK). 3. Due to the print heads in staggered arrangement, the product is improved in printing speed as high as 185m²/h. HJⅡ 5000SW Color Inkjet Printer 1. The printing precision of our color inkjet printer is 600 dpi, which ensures the images printed by this inkjet printing machine feature high . ..